My implementation makes an attempt at still using markdown for that page. My original idea was to just wrap recommendation and fixable in backticks to get them to be inline code blocks and then target those in css using li > code; however, then you have no guarantee you are selecting a recommended badge vs a fixable badge. I think it's an idea worth exploring. I'm not a fan of this treatment, but if someone can come up with a nice treatment for it, seems like a nice addition. Just curious, are you not a fan of the design, implementation, or both? Design-wise I just took the inline code blocks and hue-shifted them. I'm not a fan all around. The colors look awful to me, it makes the page look like holiday lights. The design looks okay to me, but I can see an argument for fewer colors for ease of contrast. What sort of thing would you like to see instead? For example, would it look better if it were more tabular, where there would be a column for fixable and a column for recommended? Tables are something I had considered as well. I think the main concern there is responsive design. How about a subtle wrench icon to indicate fixable rules? In that case we should also change recommended to something like a check mark. I agree with being consistent about icons/words, but not sure if a check mark is immediately obvious. What about a thumbs-up? I like this idea - still looking for someone to take this on? I like the idea of having icons that represent these categories. Bootstrap's glyphicon-wrench and glyphicon-star make a lot of sense to me. @kaicataldo Yes. Do you want to make local change and post a screenshot? I was thinking something along these lines? Thoughts? I think that looks pretty good. The only thing I would do is separate legend from the text, just before "Possible Errors" I would put "recommended - checkmark, fixable - wrench" in larger bold font. But wasn't clear on what I should do. Thanks! 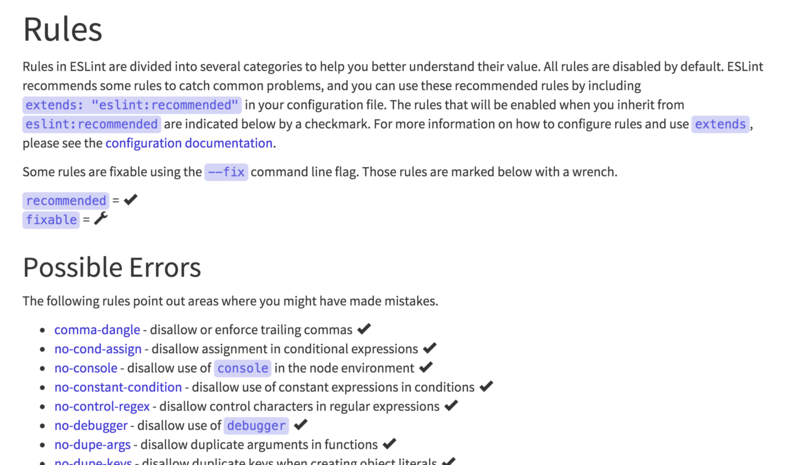 Definitely makes it easier to see which rules are recommended and fixable. Let me know if you need anything else. I like it a lot, personally. Thanks for stepping up, @kaicataldo! I do wonder a little though, without seeing the full result, how visually distinct are the wrench and checkmark? They both have a very similar shape, so if there are a few rules next to each other with alternating checks and wrenches, are they hard to tell apart? @IanVS That was a concern of mine as well when picking the icons, but I felt like they were easy enough to differentiate once I had implemented it. I can take some more screenshots of other sections with both icons when I get back to my computer. I initially tried the star icon, but felt like it was visually noisier (being solid and a larger icon). I chose the checkmark because a) I felt like it conveyed the intention clearly and b) the thinner profile of the icon made it less distracting from the text. My goal was to improve the clarity of which rules are recommended or fixable without distracting too much from the rule itself. Changing the icon is super easy though, so happy to try out some other ones if others don't feel the same way! Sure, I'm fine with that approach. It was really more of a question of how it looks, since I couldn't tell from the screenshot. Also, just realized I never actually opened a PR - remedied! I think we should keep using "(recommended)" and "(fixable)" in the .md files in this repo and then replace them with images during the build process. I'd prefer not to ask people to write HTML in the .md files, and also, avoiding HTML allows us to more easily make changes later. And, we need to be sure the images are accessible, so either use actual <img> tags with alt or something else that provides descriptive text (aria-label, title, etc.). @BYK We are using github pages, I don't think they can use remark. @ilyavolodin can't we use remark as a processing stage? Like master would be the raw version and "remarked version" would go to gh-pages. Dunno, just thinking aloud here. In all honesty, I wouldn't spend too much time on those enhancements. Once we have metadata in all of the rules, this page will be auto-generated anyways. Updated the PR to simply replace '(recommended)' and '(fixable)' with their respective icons. Much nicer solution. The only other question I have is if you want me to change the index.md content to remove the icons from the intro and make a legend like my original PR did. If so, I'll open a PR to the main repo with the changes. 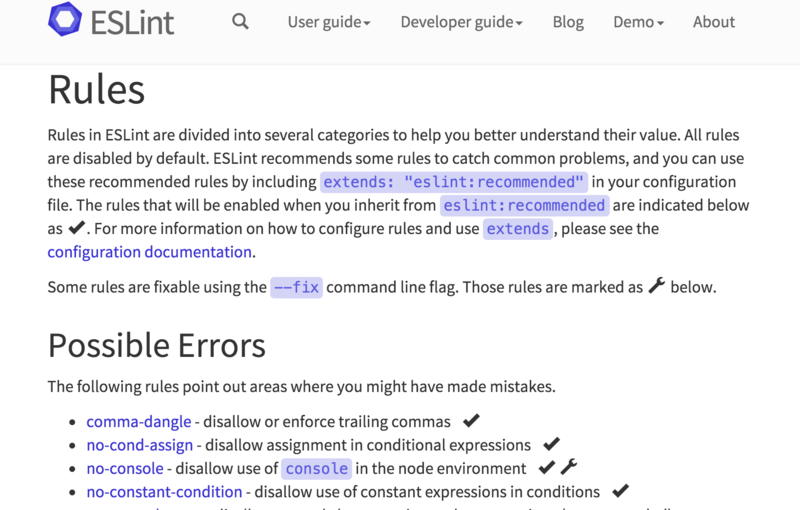 Revert "Docs: Update readme for legend describing rules icons (refs #4355)"